Editor’s note: Listen to the podcast of the event. GALLIPOLIS — With names such as Pro Wells and Sir Patrick Scott, Marshall University football fans have every reason to be excited about this year’s Thundering Herd football recruiting class. The Marshall football coaching staff, led by head coach John “Doc” Holliday” dropped in Monday night on the Mason-Gallia-Meigs Big Green Club in Gallipolis to present their official 2016 recruiting class. And one of those recruits is from the Ohio Valley. Before introducing the newest crop of prospective Thundering Herd players, Holliday talked about the Marshall recruiting process. He said recruiting is “really simple” in terms of getting players to visit Marshall and commit to the program. Holliday is entering his seventh season as head coach of the Herd, amassing a 50-28 record since taking over in 2010. His teams are 4-0 in bowl games, with wins in Beef O’Brady Bowl, Military Bowl, Boca Raton Bowl and St. Petersburg Bowl. Holliday’s 2014 Thundering Herd won the school’s first Conference USA championship with a win over Louisiana Tech. He was named the conference’s Coach of the Year that season. Jacob Hill, president of the local MGM Big Green Club, said Holliday visits every year to show the group video clips and talk about the Herd’s newest recruits for the upcoming season. Monday’s event also serves as a fundraiser to support Marshall University athletics. People need not have any connection to Marshall University to become a member of the group. Mike Hamrick, Marshall’s director of athletics, said fans will see this year’s recruiting class rack up awards such as all-conference, conference player of the year, defensive player of the year and others in seasons to come. With a list full of recruits from across the country, the local Big Green Club was more interested in one of their own, Point Pleasant Junior/Senior High School football standout Cody Mitchell, who recently signed with the Herd. Hamrick said Marshall’s sporting facilities make it a major player on the NCAA recruiting scene, attracting recruits and opponents to Huntington, W.Va.
Holliday finished his quick talk by urging Marshall University supporters to fill the stands at Joan C. Edwards Stadium on game nights. He referenced last year’s game at home against Purdue in which the crowd was one of the most boisterous he’s ever encountered. 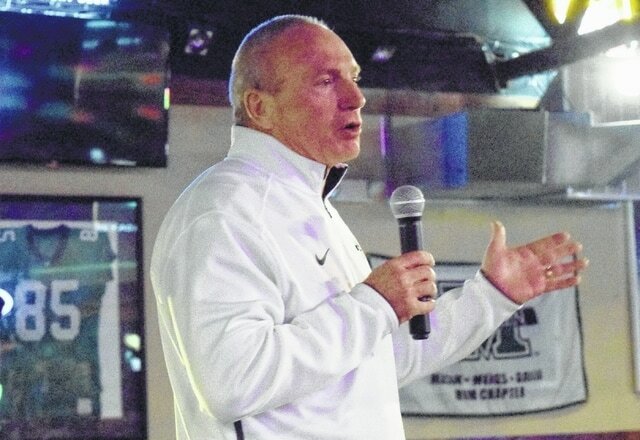 Marshall University head football coach “Doc” Holliday speaks to Thundering Herd supporters Monday night in Gallipolis. Holliday and his coaching staff introduced the Herd’s 2016 football recruiting class, which consists of Point Pleasant’s own Cody Mitchell. http://aimmedianetwork.com/wp-content/uploads/sites/42/2016/02/web1_DSC_0467.jpgMarshall University head football coach “Doc” Holliday speaks to Thundering Herd supporters Monday night in Gallipolis. Holliday and his coaching staff introduced the Herd’s 2016 football recruiting class, which consists of Point Pleasant’s own Cody Mitchell.